Back pain has become one of the most common discomforts of all people since the use of technological devices and stress are potential causes of its continuous appearance. The most normal thing is that the pain disappears with a little rest and the consumption of some analgesic; however, it can sometimes remain for longer than normal, requiring another type of treatment. Although at first sight, it does not seem appropriate, the practice of some yoga postures can serve as therapy to improve this symptom. Through this, it stimulates circulation and relieves muscle tension that prevents the ailment calms quickly. This movement provides the necessary stretching for the stressed muscles of the spine and stimulates the nervous system. Stand on a yoga mat and spread the feet to the width of the hips. Bend your knees and lean forward so that your torso is on your legs until your belly touches your thighs. Make two fists and put them in the folds of the opposite elbows. Relax your back, neck, and head, and squeeze your fists. Perform between 10 and 20 repetitions, inhaling and exhaling. This movement is a bit more complex and requires a lot of practice to do it in the right way. It is ideal for pain in the lower back, but also to relieve tension in the upper part of the body. Stand to face a wall with arms outstretched, and lean forward, placing the palms of your hands on the wall, fingers stretched out. Reaffirm the position of the fingers on the wall and draw the navel back, as you stretch the coccyx towards the ground. Lift the ribs from the pelvis, so that you achieve a natural curvature of the lower back and an active belly. 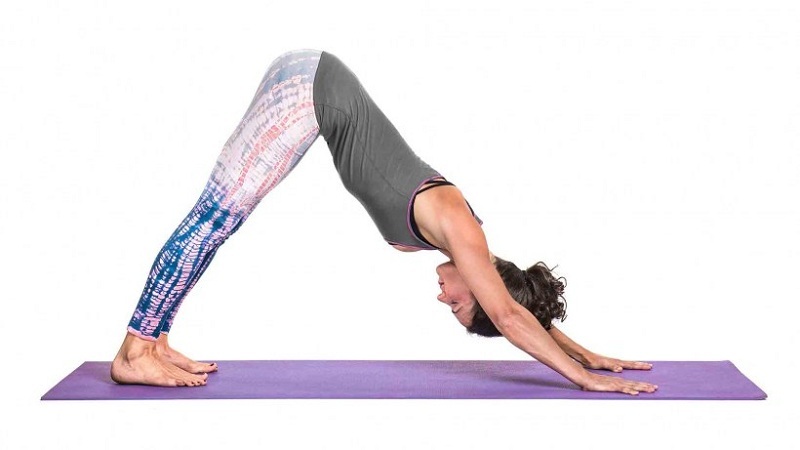 Keep the spine stretched and begin to walk with the legs back, bending the waist and forming an L.
Repeat this exercise with 10 or 20 breaths and return to the starting position. The upside down dog or “Adho Mukha Svanasana” is an ideal posture to warm up, as it involves a stretch of the entire body. Tones the nerves of the spine and promotes blood circulation from the lower area of the skin to the head. It also serves to strengthen the muscles and joints of the arms, legs, neck, and back. Place yourself in a doggie position, with your feet as wide as your hips and your palms as a point of support. Next, support the metatarsals and get up on your dog face down. It is important that you do not arch your back too far because it can contract muscles badly. Raise the front ribs to give firmness to the shoulders and spine. Push the coccyx towards the heels and press again through the inside and outside of the feet. The “Balasana” or position of the child is a relaxed movement that generates an active stretch to lengthen the spine. It serves to rest between exercises or finish a stretching routine. It is recommended to calm the tension associated with stress. Turn around and stand in four-point position, to make the child’s posture one or several minutes. Try the pose with the knees apart, the big toes in contact and then join the knees for a stretch of the spinal cord. If your head does not reach the ground, place a block of yoga or the dots under your forehead so that it relaxes completely. The arms can also be placed on the sides of the body. Inhale deeply and in each exhale you feel how the tension dissolves. 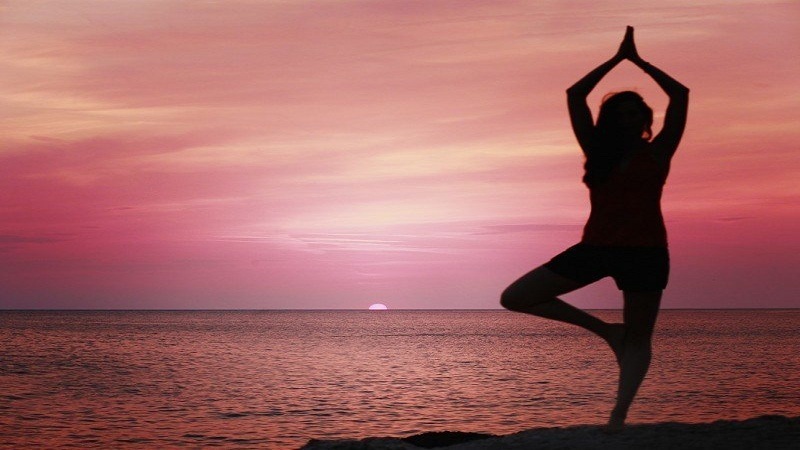 As you can see it is very easy to do some yoga postures to increase our sense of well-being. If you combine them with breathing or meditation exercises you can get many benefits for the balance of your body and mind. It is best yoga postures to reduce back pain. Keep reading how to progress in yoga.